The Broadway Princesses want to empower girls to DREAM BIG and TAKE ACTION to MAKE THE WORLD A BETTER PLACE! 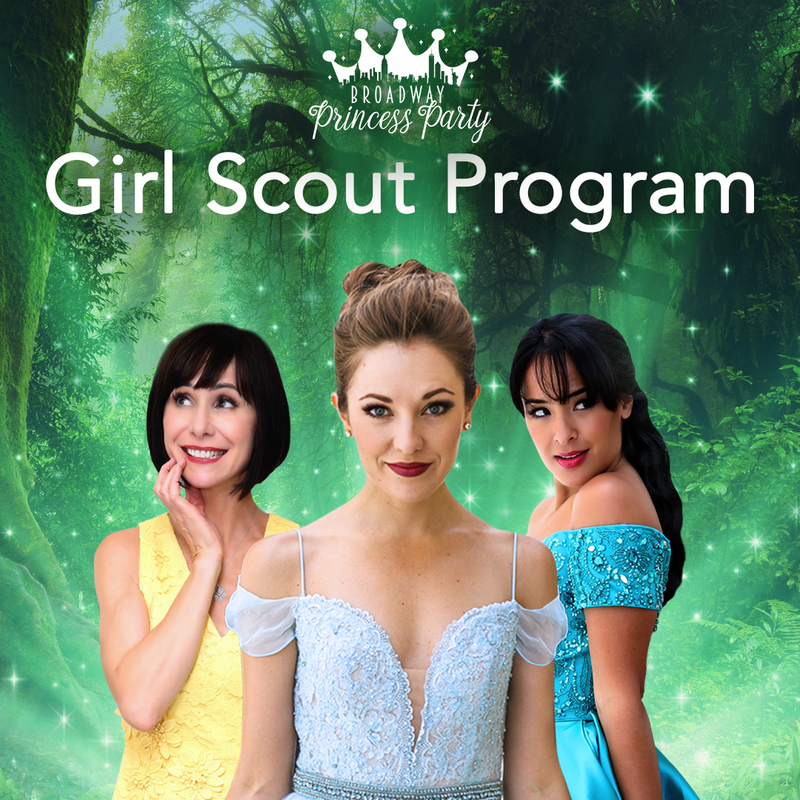 Welcome to the BROADWAY PRINCESS PARTY – SCOUT PROGRAM! The producers of BPP have taken it upon themselves to underwrite a portion of this program in order to expand audiences and give more young people (and their families) access to the thrill of live theatre. The Princesses are also passionate about building bridges to the communities they visit and opening up a dialogue between working artists and girls. We truly hope to give your troop an incredible live-theatre experience (you can even have more fun by dressing in costumes/cosplay for the show!) as well as have a one-on-one conversation with one of our Princesses and your scouts via a Skype Q&A. And because it’s a party, we’ve surrounded this opportunity with a whole package of other goodies as well …. 10% discount on any priced ticket, including the already-discounted student ticket. These are good for any scout, sibling AND adult in the group! An age-appropriate, activity booklet for your troop, which discusses everything from Broadway and leadership, to modern-day princesses and how they take action for the benefit of others. The booklet is available at the Brownie, Junior, and Cadette-Ambassador level. BEST PART: a FREE 30-minute Skype Q&A for your troop (ideal for a meeting) with one of the Broadway Princesses. Your scouts can talk to a real, Broadway actress and ask them anything – LIVE! This program aligns with badges and journeys at all levels, including but not limited to: Brownie: (Making Friends, World of Girls) Junior: (Musician, Playing the Past, Entertainment Technology, Product Designer, MUSE) Cadette: (Public Speaker, MEdia), Senior (Girltopia, Troupe Performer, Mission Sisterhood, Social Innovator, Business Etiquette), Ambassador (Your Voice Your World, Bliss – Live It), and more! 1. Click here for a list of concert dates https://broadwayprincessparty.com/tour-launch/. Find a show near you and purchase a minimum of 6 tickets (no limit on the maximum) for any scout, sibling, friend, and adult in your group. Use Code: GSUSA to receive an additional 10% off. Our Princess representative will respond with a confirmation and an attachment of the pdf booklet for your troop. She will also help to arrange your Skype Q&A with an available cast member. *While we’d like to honor personal requests, we cannot guarantee any specific cast member for your Skype Q&A, but we will do our best to schedule the event based on your and their availability. We cannot guarantee that our Princesses are available for any email-requested time, but should that issue arise, we will work with you to find a time that works for all. Thanks for understanding!